What has Voyager 1 been doing lately? I’ll skip its amazing exploration of the Solar System…. Soon afterwards, its cameras were deactivated to conserve power and computer resources. The camera software has been removed from the spacecraft, so it would now be hard to get it working again. And here on Earth, the software for reading these images is no longer available! On February 17, 1998, Voyager 1 reached a distance of 69 AU from the Sun — 69 times farther from the Sun than we are. At that moment it overtook Pioneer 10 as the most distant spacecraft from Earth! Traveling at about 17 kilometers per second, it was moving away from the Sun faster than any other spacecraft. It still is. That’s 520 million kilometers per year — hard to comprehend. I find it easier to think about this way: it’s 3.6 AU per year. That’s really fast… but not if you’re trying to reach other stars. It will take 20,000 years just to go one light-year. As Voyager 1 headed for interstellar space, its instruments continued to study the Solar System. Scientists at the Johns Hopkins University said that Voyager 1 entered the termination shock in February 2003. This is a bit like a ‘sonic boom’, but in reverse: it’s the place where the solar wind drops to below the speed of sound. Yes, sound can move through the solar wind, but only sound with extremely long wavelengths — nothing you can hear. Some other scientists expressed doubt about this, and the issue wasn’t resolved until other data became available, since Voyager 1’s solar-wind detector had stopped working in 1990. This failure meant that termination shock detection had to be inferred from the other instruments on board. We now think that Voyager 1 reached the termination shock on December 15, 2004 — at a distance of 94 AU from the Sun. heliosheath. This is a bubble of stagnant solar wind, moving below the speed of sound. It’s outside the termination shock but inside the heliopause, where the interstelllar wind crashes against the solar wind. checked their data against data from the Deep Space Network station in Madrid, Spain and yes — it matched. 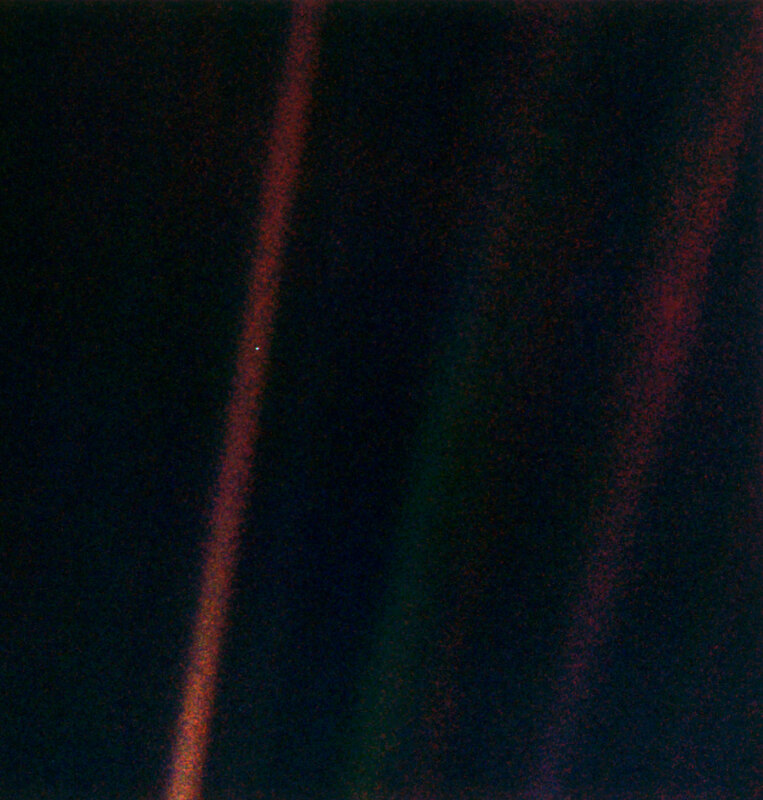 This was the first amateur tracking of Voyager 1! 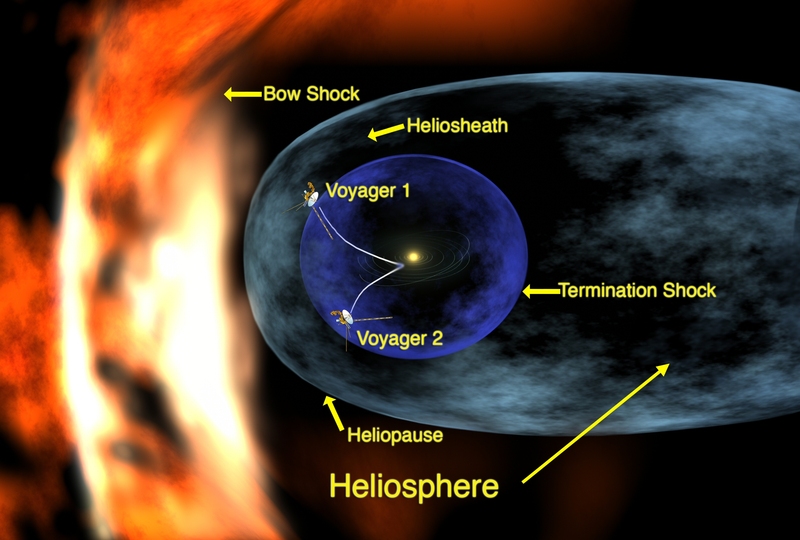 aboard Voyager 1 showed that it passed the point where the solar wind flows away from the Sun. At this point the solar wind seems to turn sideways, due to the push of the interstellar wind. On this date, the spacecraft was approximately 17.3 billion kilometers from the Sun, or 116 AU. In March 2011, Voyager 1 was commanded to change its orientation to measure the sideways motion of the solar wind. How? I don’t know. Its solar wind detector was broken. But anyway, a test roll done in February had confirmed the spacecraft’s ability to maneuver and reorient itself. So, in March it rotated 70 degrees counterclockwise with respect to Earth to detect the solar wind. This was the first time the spacecraft had done any major maneuvering since the family portrait photograph of the planets was taken in 1990. After the first roll the spacecraft had no problem in reorienting itself with Alpha Centauri, Voyager 1’s guide star, and it resumed sending transmissions back to Earth. 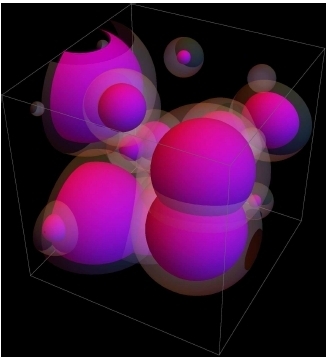 Puzzle: What the heck is Lyman-alpha radiation? On December 5, 2011, Voyager 1 saw that the Solar System’s magnetic field had doubled in strength, basically because it was getting compressed by the pressure of the interstellar wind. Energetic particles originating in the Solar System declined by nearly half, while the detection of high-energy electrons from outside increased 100-fold. In June 2012, NASA announced that the probe was detecting even more charged particles from interstellar space. This meant that it was getting close to the heliopause: the place where the gas of interstellar space crashes into the solar wind. Voyager 1 actually crossed the heliopause in August 2012, although it took another year to confirm this. It was 121 AU from the Sun. 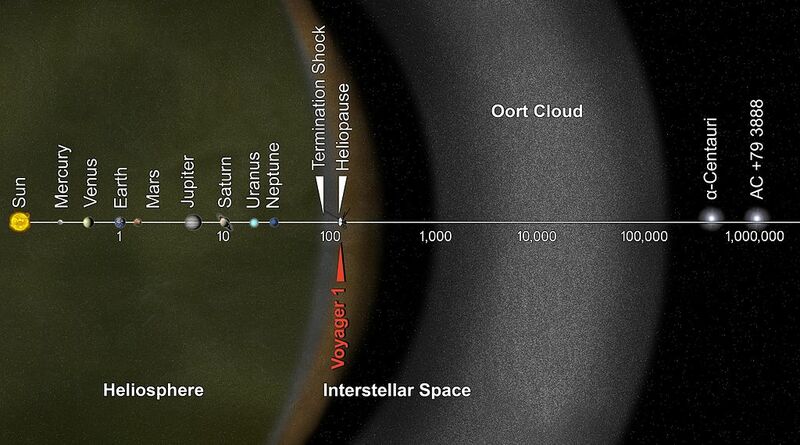 In about 300 years Voyager 1 will reach the Oort cloud, the region of frozen comets. It will take 30,000 years to pass through the Oort cloud. Though it is not heading towards any particular star, in about 40,000 years it will pass within 1.6 light-years of the star Gliese 445.
to wander the Milky Way. That’s an exaggeration. The Milky Way will not last forever. In just 3.85 billion years, before our Sun becomes a red giant, the Andromeda galaxy will collide with the Milky Way. In just 100 trillion years, all the stars in the Milky Way will burn out. And in just 10 quintillion years, the Milky Way will have disintegrated, with all the dead stars either falling into black holes or being flung off into intergalactic space. But still: the Voyagers’ journeys are just beginning. Let’s wish them a happy 40th birthday! 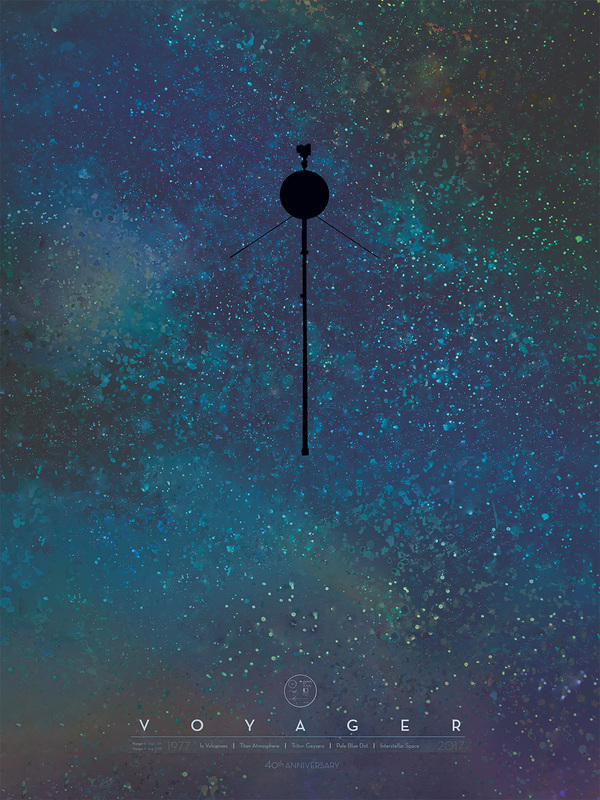 • NASA, NASA and iconic museum honor Voyager spacecraft 40th anniversary, August 30, 2017. • K.-P. Schröder and Robert Connon Smith, Distant future of the Sun and Earth revisited, 2008. The present Sun is increasing its average luminosity at a rate of 1% in every 110 million years, or 10% over the next billion years. Unfortunately I feel a bit doubtful about this, in particular after I looked at some irradiation measurements. But let’s recap a bit. In the Azimuth Forum I asked for information about solar irradiance measurements . Why I was originally interested in how bright the Sun is shining is a longer story, which includes discussions about the global warming potential of methane. For this post I prefer to omit this lengthy historical survey about my original motivations (maybe I’ll come back to this later). Meanwhile there is an also a newer reason why I am interested in solar irradiance measurements, which I want to talk about here. Strictly speaking I was not only interested in knowing more about how bright the sun is shining, but how bright each of its ‘components’ is shining. That is, I wanted to see spectrally resolved solar irradiance measurements—and in particular, measurements in the range between the wavelengths of roughly 650 and 950 nanometers. This led me to the the Sorce mission, which is a NASA sponsored satellite mission, whose website is located at the University of Colorado. The website very nicely provides an interactive interface including a fairly clear and intuitive LISIRD interactive app with which the spectral measurements of the Sun can be studied. Now, fluctuations within certain spectral ranges within the Sun’s spectrum are not news. Here, however, it looked as if a rather stable range suddenly started to change rather “dramatically”. Spectral measurements are complicated and prone to measurement errors. Subtle issues of dirty lenses and the like are already enough to suggest that this is no easy feat, so that this strange rise might easily be due to a measurement failure. Moreover, as I said, it looked as this was a fairly stable range over the course of ten years. But maybe this new rise in irradiation is part of the 11 years solar cycle, i.e., a common phenomenon. In addition, although the rise looks big, it may overall still be rather subtle. So: how subtle or non-subtle is it then? In order to assess that, I made a quick estimate (see the Forum discussion) and found that if all the additional radiation would reach the ground (which of course it doesn’t due to absorption), then on 1000 square meters you could easily power a lawn mower with that subtle change! I.e., my estimate was 1200 watts for that patch of lawn. Whoa! I now used my program to calculate the irradiance for one day in 2016 between the wavelengths of 180.5 nm and 1797.62 nm, a quite big part of the solar spectrum, and got the value 627 W/m2. I computed the difference between this and one day in 2003, approximately one solar cycle earlier. 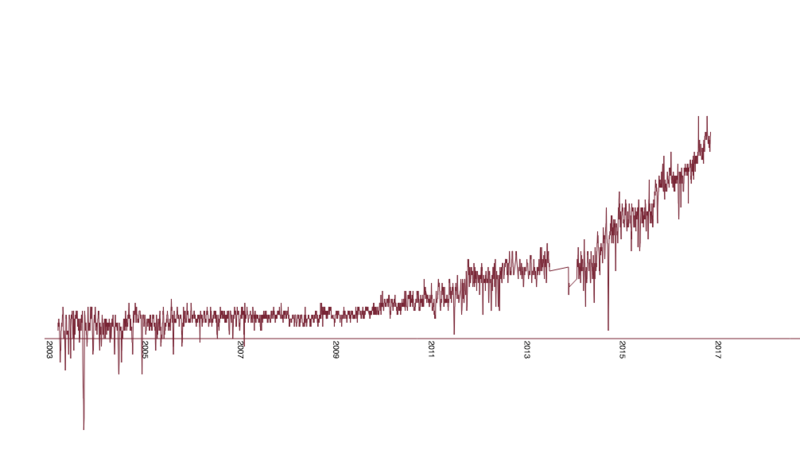 I got 0.61 W/m2, which is 0.1% in 13 years, rather then 24 years. Of course this is not an average value, and not really well adjusted to the sun cycle, and fluctuations play a big role in some parts of the spectrum, but well—this might indicate that the overall rate of rise in solar radiation may have doubled. Likewise concerning the question of the sun’s luminosity: for assessing luminosity one would need to take the concrete satellite-earth orbit at the day of measurement into account, as the distance to the sun varies. But still, on a first glance this all appears disconcerting. Given that this spectral range has for example an overlap with the absorption of water (clouds! ), this should at least be discussed. The upper circle displays another rise, which is discussed in the forum. So concluding, all this looks as if this needs to be monitored a bit more closely. It is important to see whether these rises in irradiance are also displayed in other measurements, so I asked in the Azimuth Forum, but so far have gotten no answer. The Russian Wikipedia site about solar irradiance unfortunately contains no links to Russian satellite missions (if I haven’t overlooked something), and there exists no Chinese or Indian Wikipedia about solar irradiance. I also couldn’t find any publicly accessible spectral irradiance measurements on the ESA website (although they have some satellites out there). In December I wrote an email to the head of the section solar radiometry of the World Radiation Center (WRC) Wolfgang Finsterle, but I’ve had no answer yet. In short: if you know about publicly available solar spectral irradiance measurements other than the LISIRD ones, then please let me know. Here you can see the brilliant flash of a supernova as its core blasts through its surface. This is an animated cartoon made by NASA based on observations of a red supergiant star that exploded in 2011. It has been sped up by a factor of 240. 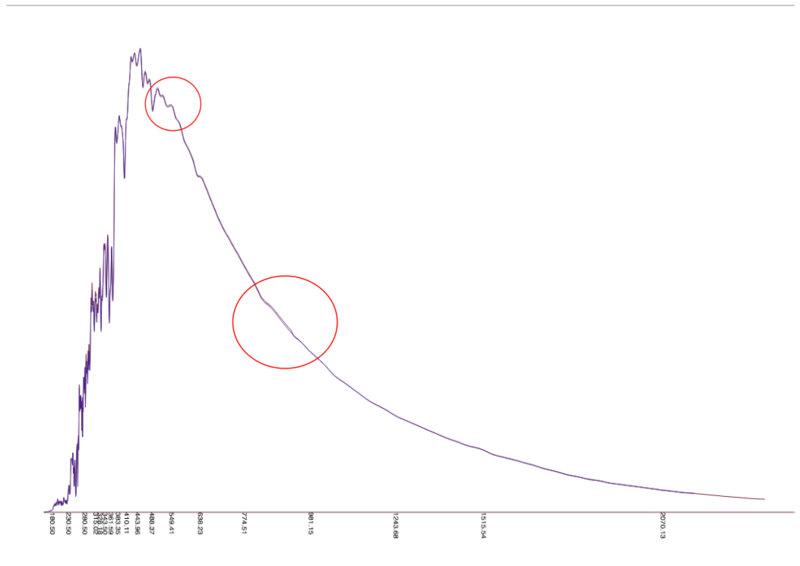 You can see a graph of brightness showing the actual timescale at lower right. When a star like this runs out of fuel for nuclear fusion, its core cools. That makes the pressure drop—so the core collapses under the force of gravity. When the core of a supernova collapses, the infalling matter can reach almost a quarter the speed of light. So when it hits the center, this matter becomes very hot! Indeed, the temperature can reach 100 billion kelvin. That’s 6000 times the temperature of our Sun’s core! For a supernova less than 25 solar masses, the collapse stops only when the core is compressed into a neutron star. 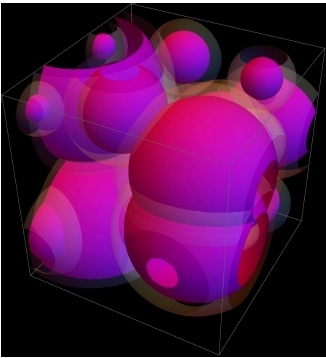 As this happens, lots of electrons and protons become neutrons and neutrinos. Most of the resulting energy is instantly carried away by a ten-second burst of neutrinos. This burst can have an energy of 1046 joules. It’s hard to comprehend this. It’s what you’d get if you suddenly converted the mass of 18,000 Earths into energy! Astronomers use a specially huge unit with such energies: the foe, which stands for ten to the fifty-one ergs. That’s 1044 joules. So, a supernova can release 100 foe in neutrinos. By comparison, only 1 or 2 foe come out as light. Why? Neutrinos can effortlessly breeze through matter. Light cannot! So it takes longer to actually see things happen at the star’s surface—especially since a red supergiant is large. This one was about 500 times the radius of our Sun. So what happened? A shock wave rushed upward through the star. First it broke through the star’s surface in the form of finger-like plasma jets, which you can see in the animation. 20 minutes later, the full fury of the shock wave reached the surface—and the doomed star exploded in a blinding flash! This is called the shock breakout. Then the star expanded as a blue-hot ball of plasma. • P. M. Garnavich, B. E. Tucker, A. 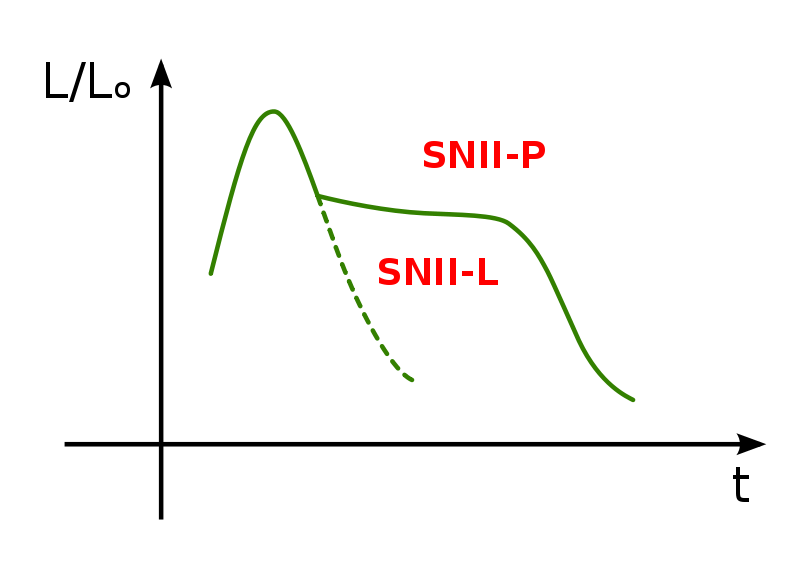 Rest, E. J. Shaya, R. P. Olling, D. Kasen and A. Villar, Shock breakout and early light curves of Type II-P supernovae observed with Kepler. I just learned something cool: 0.4 seconds after LIGO saw those gravitational waves on 14 September 2015, a satellite named Fermi detected a burst of X-rays! 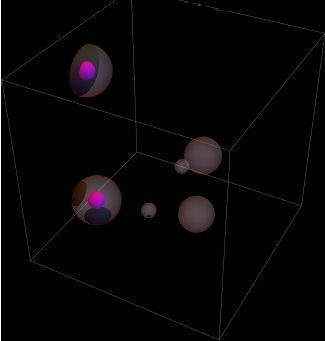 • V. Connaughton et al, Fermi GBM observations of LIGO gravitational wave event GW150914. It lasted one second. It was rather weak (for such things). The photons emitted ranged from 50 keV to 10 MeV in energy, with a peak around 3.5 MeV. The paper calls this event a ‘hard X-ray source’. Wikipedia says photons with an energy over 100 keV deserve the name gamma rays, while those between 10 keV and 100 keV are ‘hard X-rays’. 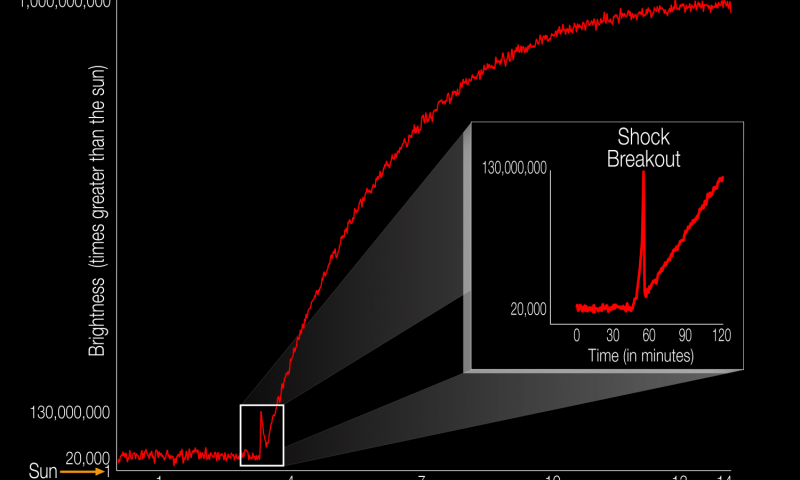 So, maybe this event deserves to be maybe a gamma ray burst. I suppose it’s all just a matter of semantics: it’s not as if there’s any sharp difference between a highly energetic X-ray and a low-energy gamma ray. Whatever you call it, this event does not appear connected with other previously known objects. It’s hard to tell exactly where it happened. But its location is consistent with what little we know about the source of the gravitational waves. If this X-ray burst was caused by the same event that created the gravitational waves, that would be surprising. Everyone assumed the gravitational waves were formed by two large black holes that had been orbiting each other for millions or billions of years, slowly spiraling down. In this scenario we don’t expect much electromagnetic radiation when the black holes finally collide. Perhaps those expectations are wrong. Or maybe—just maybe—both the gravitational waves and X-rays were formed during the collapse of a single very large star! That’s what typically causes gamma ray bursts—we think. But it’s not at all typical—as far as we know—for a large star to form two black holes when it collapses! And that’s what we’d need to get that gravitational wave event: two black holes, which then spiral down and merge into one! • Abraham Loeb, Electromagnetic counterparts to black hole mergers detected by LIGO. As he notes, the collapsing star would need to have an insane amount of angular momentum to collapse into a dumb-bell shape and form two black holes, each roughly 30 times the mass of our Sun, which then quickly spiral down and collide. • ANTARES collaboration, High-energy neutrino follow-up search of Gravitational wave event GW150914 with ANTARES and IceCube. • V. Savchenko et al, INTEGRAL upper limits on gamma-ray emission associated with the gravitational wave event GW150914. It will take a while to sort this out. Shortly after the September event, LIGO recorded another, weaker signal that was probably also from black holes, the team said. According to Dr. Weiss, there were at least four detections during the first LIGO observing run, which ended in January. The second run will begin this summer. In the fall, another detector, Advanced Virgo, operated by the European Gravitational Observatory in Italy, will start up. There are hopes for more in the future, in India and Japan. So we will know more soon! The Laser Interferometric Gravitational-Wave Observatory or LIGO is designed to detect gravitational waves—ripples of curvature in spacetime moving at the speed of light. It’s recently been upgraded, and it will either find gravitational waves soon or something really strange is going on. Rumors are swirling that LIGO has seen gravitational waves produced by two black holes, of 29 and 36 solar masses, spiralling towards each other—and then colliding to form a single 62-solar-mass black hole! You’ll notice that 29 + 36 is more than 62. So, it’s possible that three solar masses were turned into energy, mostly in the form of gravitational waves! According to these rumors, the statistical significance of the signal is supposedly very high: better than 5 sigma! That means there’s at most a 0.000057% probability this event is a random fluke – assuming nobody made a mistake. If these rumors are correct, we should soon see an official announcement. If the discovery holds up, someone will win a Nobel prize. The discovery of gravitational waves is completely unsurprising, since they’re predicted by general relativity, a theory that’s passed many tests already. But it would open up a new window to the universe – and we’re likely to see interesting new things, once gravitational wave astronomy becomes a thing. • Tale of a doomed galaxy, Azimuth, 8 November 2015. The first four sections of that long post discuss gravitational waves created by black hole collisions—but the last section is about LIGO and an earlier round of rumors, so I’ll quote it here! 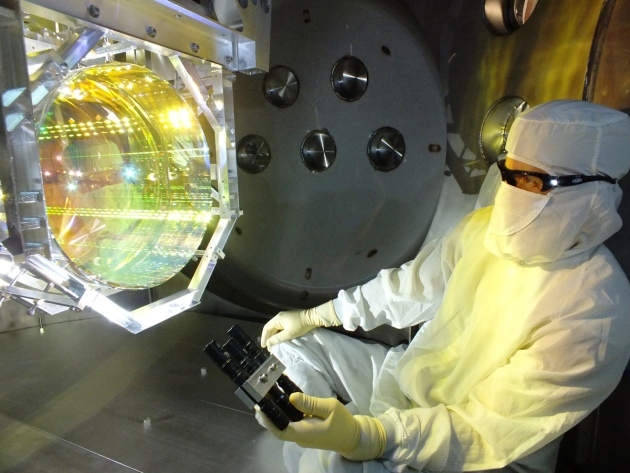 LIGO stands for Laser Interferometer Gravitational Wave Observatory. The idea is simple. You shine a laser beam down two very long tubes and let it bounce back and forth between mirrors at the ends. You use this compare the length of these tubes. When a gravitational wave comes by, it stretches space in one direction and squashes it in another direction. So, we can detect it. Sounds easy, eh? Not when you run the numbers! We’re trying to see gravitational waves that stretch space just a tiny bit: about one part in 1023. At LIGO, the tubes are 4 kilometers long. So, we need to see their length change by an absurdly small amount: one-thousandth the diameter of a proton! • They bounce the light back and forth many times, effectively increasing the length of the tubes to 1800 kilometers. • There’s no air in the tubes—just a very good vacuum. • They hang the mirrors on quartz fibers, making each mirror part of a pendulum with very little friction. This means it vibrates very well at one particular frequency, and very badly at frequencies far from that. This damps out the shaking of the ground, which is a real problem. • This pendulum is hung on another pendulum. • That pendulum is hung on a third pendulum. • That pendulum is hung on a fourth pendulum. • The whole chain of pendulums is sitting on a device that detects vibrations and moves in a way to counteract them, sort of like noise-cancelling headphones. • There are 2 of these facilities, one in Livingston, Louisiana and another in Hanford, Washington. Only if both detect a gravitational wave do we get excited. I visited the LIGO facility in Louisiana in 2006. It was really cool! Back then, the sensitivity was good enough to see collisions of black holes and neutron stars up to 50 million light years away. Here I’m not talking about the supermassive black holes that live in the centers of galaxies. I’m talking about the much more common black holes and neutron stars that form when stars go supernova. Sometimes a pair of stars orbiting each other will both blow up, and form two black holes—or two neutron stars, or a black hole and neutron star. 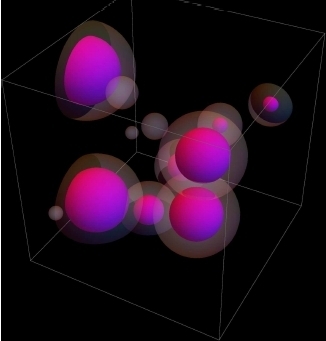 And eventually these will spiral into each other and emit lots of gravitational waves right before they collide. 50 million light years is big enough that LIGO could see about half the galaxies in the Virgo Cluster. Unfortunately, with that many galaxies, we only expect to see one neutron star collision every 50 years or so. They never saw anything. So they kept improving the machines, and now we’ve got Advanced LIGO! This should now be able to see collisions up to 225 million light years away… and after a while, three times further. They turned it on September 18th. Soon we should see more than one gravitational wave burst each year. LIGO is almost unique among physics experiments in practising ‘blind injection’. A team of three collaboration members has the ability to simulate a detection by using actuators to move the mirrors. “Only they know if, and when, a certain type of signal has been injected,” says Laura Cadonati, a physicist at the Georgia Institute of Technology in Atlanta who leads the Advanced LIGO’s data-analysis team. Aargh! The disappointment would be crushing. But with luck, Advanced LIGO will soon detect real gravitational waves. And I hope life here in the Milky Way thrives for a long time – so that when the gravitational waves from the doomed galaxy PG 1302-102 reach us, hundreds of thousands of years in the future, we can study them in exquisite detail. • Davide Castelvecchi Has giant LIGO experiment seen gravitational waves?, Nature, 30 September 2015. • John Baez, This week’s finds in mathematical physics (week 241), 20 November 2006. 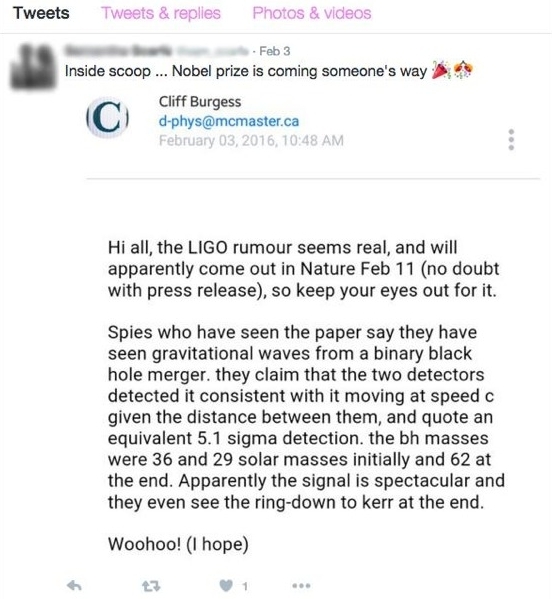 • The LIGO Scientific Collaboration Advanced LIGO, 17 November 2014. In December, the rover Curiosity reached some sand dunes on Mars, giving us the first views of these dunes taken from the ground instead of from above. It’s impressive how the dune seems to shoot straight up from the rocks here! 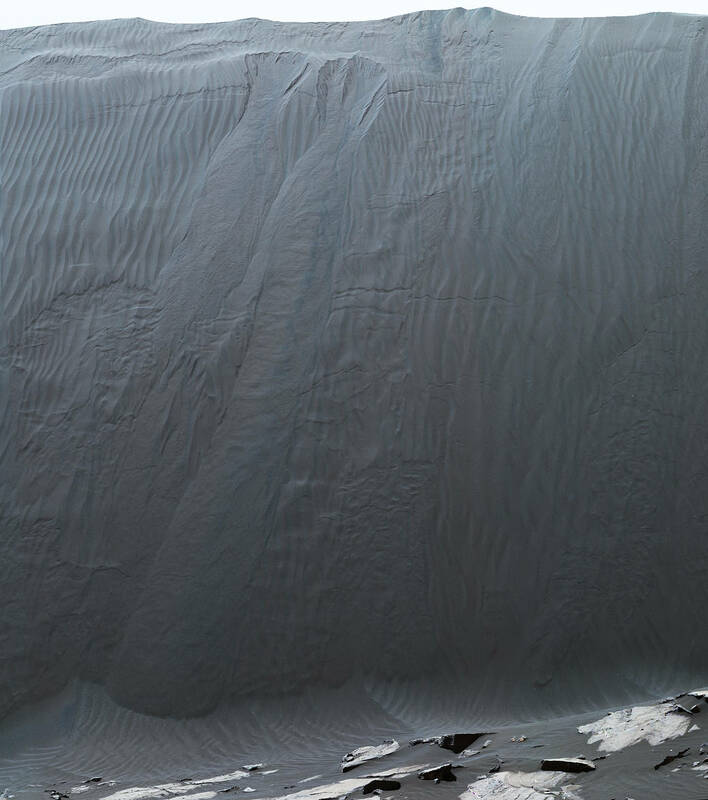 In fact this slope—the steep downwind slope of one of “Bagnold Dunes” along the northwestern flank of Mount Sharp—is just about 27°. But mountaineers will confirm that slopes always looks steeper than they are. The wind makes this dune move about one meter per year. • NASA, NASA Mars rover Curiosity reaches sand dunes, 10 December 2015. • Jet Propulsion Laboratory, Mastcam telephoto of a Martian dune’s downwind face, 4 January 2016. • Jet Propulsion Laboratory, Slip face on downwind side of ‘Namib’ sand dune on Mars, 6 January 2016.